Bookshare is a platform that provides access to a huge library of reading materials for people with physical disability or visual impairment. 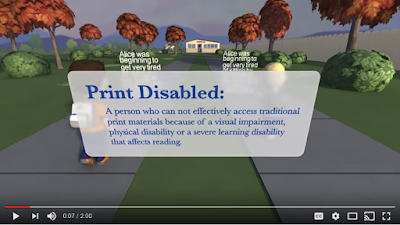 The library has over 500.000 titles covering different content areas and available in formats that individuals with print disabilities can read. There are different ways you can read Bookshare books. You can listen to them with hight quality text-to-speech voices. You can also hear and see highlighted words on screen or read them with digital braille or enlarged fonts. Another alternative is to read directly from your own Internet browser. Bookshare is available for free for qualified US students. Non students and other organizations pay a small fee. Watch the video below to learn more about Bookshare.